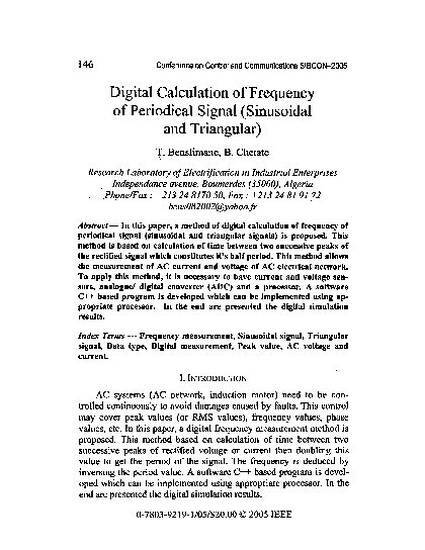 – In This paper, a method of digital calculation of frequency of periodical signal (sinusoidal, triangular and square signals) is proposed. This method is based on calculation of time between two successive peaks of the rectified signal which constitutes it’s half period. This method allows the measurement of AC current and voltage of AC electrical network. To apply this method, it is necessary to have current and voltage sensors, analogue/ digital converter (ADC) and a processor. A software C++ based program is developed which can be implemented using appropriate processor. In the end are presented the digital simulation results.